For beef and dairy cattle, including lactating dairy cattle Protects cattle from flies and lice that can reduce cattle weight gain. 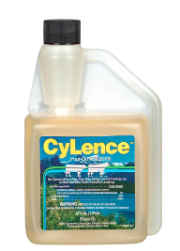 Ready-to-use; no mixing required The active ingredient cyfluthrin is effective at low dose rates can be used on cattle of all ages; no meat withdrawal requirements one treatment provides effective control for up to three weeks. Proven to control: horn flies, face flies, the mechanical vector of the moraxella bovis bacteria that causes pinkeye in cattle, biting lice, and sucking lice.